We are living in an age where we pop pills for every minor ailment or a slight discomfort, without worrying about the side effects or taking time to understand the root cause. Home remedies using natural products (herbs, spices and greens) are considered “old-fashioned”. Even if people believe in such home remedies, they find it tedious or time consuming to make a herbal concoction and drink it. Quick-fix solutions are sought out to move on with our busy lives. Around 4-5 years back, I decided that I wouldn’t take painkillers or paracetamol tablets for minor ailments like headache, migraine, fever, cough, cold etc. I stopped taking antacids as well. Regular readers of my blog (or Instagram feed) would know how much I rely on home remedies. Dry ginger coffee for cold and fever, jeera ajwain tea for bloating and indigestion, lemon water for migraine and many such simple, effective herbal home remedies work brilliantly. And I’m always on the look-out to learn more such natural healing techniques. I'm a huge fan of Dr. G. Sivaraman’s works - his books, articles and speeches are informative and inspiring from a health and wellness perspective. I recently finished his book “Naattu Marundhu Kadai”. A good reference material on various spices, herbs, greens and roots that are commonly available and used to treat many ailments and diseases in Siddha and Ayurveda practice. - Dry ginger (sukku) - helps to balance pitta. Controls indigestion, very effective for sinus headache and migraine. - Peppercorns - effective in treating allergy sneezing, cold and cough. 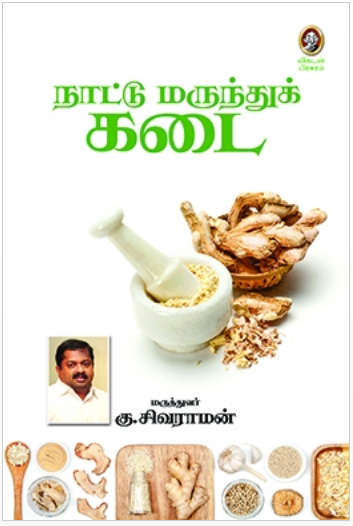 The book also covers the benefits of greens such as kuppaimeni, nochi, aadathodai, thoodhuvalai, sittraamutti etc, which we may have either forgotten or have never heard of. If you can read Tamil, I highly recommend you get a copy and read this book. You can order online from this link.